We service the entire GTA area. Get a free estimate today and discover why more companies are selecting us for their GTA window cleaning needs. 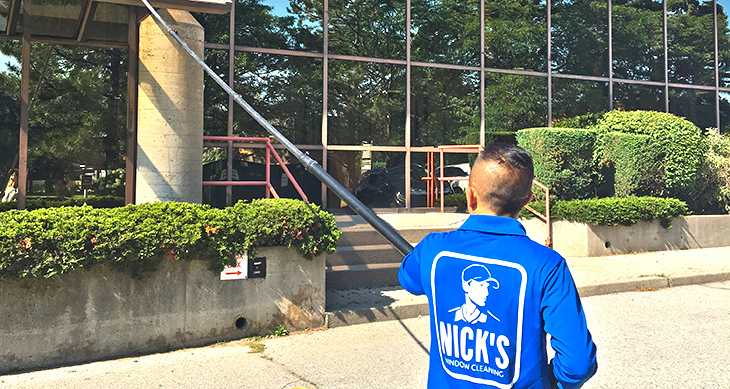 NICK’S Window Cleaning works directly with each and every one of our clients to create fully customized and accommodating plans that work for your business. When you call us for a free estimate, we’ll take into consideration all of your requirements, including your budget, and help come up with a plan that meets your needs. Rather than selling you a prepackaged plan that only meets some of your requirements, we want to create something that’s tailor made and, as a result, much better for you. We are available six days a week and almost any time during the day. That means we can provide you with the services you need almost any time that you’ll need them. That way, you can have your windows cleaned when it’s most convenient for you, not whenever they can show up. So whether it’s the weekend or early in the morning, our professional window cleaners can work around your schedule, rather than the other way around. We take safety and responsibility extremely seriously. All of our staff are trained in the safest ways to go about their work, and are given the equipment they need to do it quickly and safely. But we don’t stop there. All of our employees are fully insured and bonded to protect both you and us. With such a focus on safety, we can provide the best window washing services while respecting our clients and our staff.